This was more important than writing last week. I’ve just landed back at home this week from over a month of work-related travel. I love my work but I’m not gonna lie: four weeks of travel still feels like a few weeks too many. 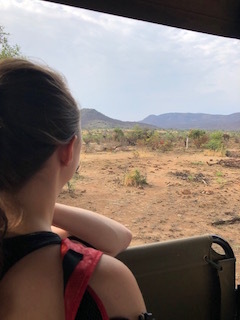 The last week was part vacation and my daughter was able to join me at a game reserve in South Africa for 3 days. We had a great time (Lions! Giraffes! Elephants! Sunshine! Oh My!) and I’m super grateful that we were able to have the time together. But in the end: 32 days away, and not a single typical writing day in the mix. There’s a dangerous myth about writing that I think does real damage to our sense of ourselves as writers. It’s (repeat after me): Real Writers Write Every Day. You and I know that’s just 100% fresh elephant dung, but the myth still persists. I think it’s connected to the myth of the Big Man, or the Great Writer. Hemingway standing over his typewriter in Key West, working away for HOURS at a time, shifting his weight from one leg to the next. Or Stephen King, writing 1,000-2,000 best-selling words, 6 pages, a day, every single day. I print out my current manuscript and carry it with me. Carrying a notebook and pen in the backpack, plus some sticky notes or index cards. A book (Or two. Okay, three…ish, not counting Kindle) in the genre of my current project. When I land and settle in, I put the manuscript out and set the books and sticky notes on the nightstand. Before turning in at night, or as jetlag wakes me, I read and then let myself take some general notes as they come. No pressure: there might be something there, or maybe not. Word count is immaterial: It’s the connection to the writing that I know I have to protect. Sometimes I can find a morning or even just one spare hour before leaving for the airport to sit down and write for a more extended period. I love it when that happens, but I don’t beat myself up if it doesn’t. This trip, I had a slightly crazed moment of typing with my thumbs to capture a new short story idea in the Notes app on my phone, and then a Short Session in the early morning while my daughter was still sleeping, and one more space on my final day in Johannesburg before leaving for the airport. That was it. And guess what? I’m still a Real Writer, this month as much as last month. I have three writing projects underway currently and work away at them as I can, as work, family and life generally allow. Hemingway be damned. Are you telling yourself a story about what it takes to be a “Real Writer” that somehow makes it impossible to see yourself in that definition? Is feeling bad about not writing keeping you from getting back to your writing? Life’s too short for that, hon. 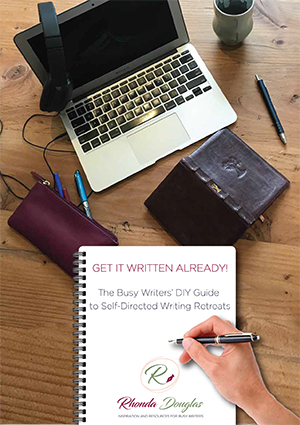 What if you just let the rhythm of your writing be what it needs to be, based on what your life looks like right now? Or just try that on for the week, and see how it feels. Would love to hear if it shifts anything for you – some find me on FaceBook or DM me on Instagram and let me know your thoughts. 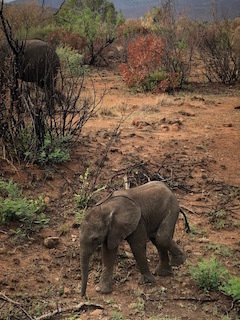 Bonus Baby Elephant Pic: Because Obviously.